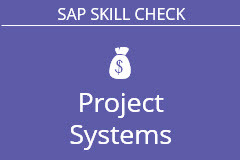 This SAP skill assessment tests your knowledge on the most common end user planning and reporting functions in SAP's Project System (PS) and Project Builder modules. Take this test now to find out where your skill level stands with SAP's PS module - then start improving your SAP skills with our hands-on simulation courses. Length: 50 random questions, 100 minutes max. The training was thorough and covered all valuable aspects of cost centers.